My junior year at high school, a college graduation speech was offered up that turned heads, mine included. It dished out guidance in a way I'd never heard it before - in a concise and directional manner. This was a guide to life and it was shared in the most simple way. Sure, our parents had given us tips on how to move forward and enjoy our youth, but it always made us all say, "ok, mom and dad, I hear ya," and then we'd move on forgetting every word. 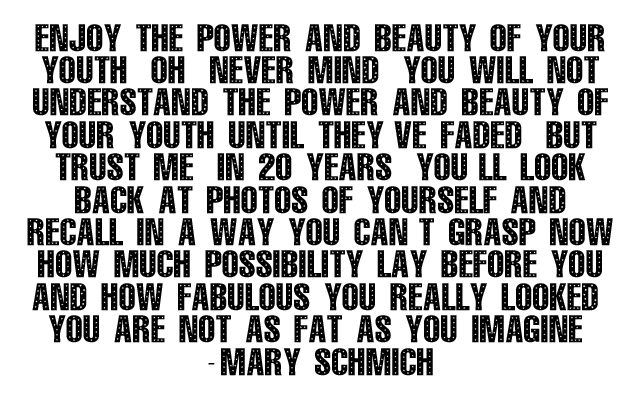 In 1997, Mary Schmich, a columist at the Chicago Tribune, published her graduation speech, the speech I'm referring to as the head turner. She offered up the most simple advice to start - "Wear Sunscreen." This became a theme. She took us through the twists and turns of what to do, who to appreciate and what actions to take to live the fullest lives, but above all we were told to wear sunscreen. Ever since the speech was published in 1997, I have kept it somewhere where I could read it and remind myself of how life is really meant to be lived. It was emailed to me by a friend, back when email was only just starting to really pick up around teens (oh how old I feel right now), and I actually have the original printed email in a box somewhere. It's a bit tattered but it remains. In 1998 Baz Luhrmann decided to take Mary's graduation speech and give it another run by turning it into a spoken song. Naturally this became the graduation song of the year, my graduation song for High School. Now, 16 years later, I still have this song on every iPod I own, now my iPhone, and I try to listen to it whenever I can. It is just about the cheesiest song out there, but it's like an old friend now speaking to me on the tube as I start to grow angry at the fact that I am crushed into a tiny space with thousands of other people. This is the voice of reason telling me to relax, it's all too short to care about these things. So today I thought I'd pass on this little gem, however cheesy it may be, to you. This is one in the hopes that these words will be as meaningful to you as they were to me, and continue to be today.